PU28 Thatch Fire Barrier, 1.3m x 50m, £450.00 per roll + haulage, no VAT. Haulage is £40 for the first roll, or part roll. Additional rolls at £30 per roll, or part roll, delivered to same address. Part rolls often available at £9 per metre, contact www.thatch-fire-barrier.co.uk for availability. Rolls can be split, for specific lengths, at £10 per metre. 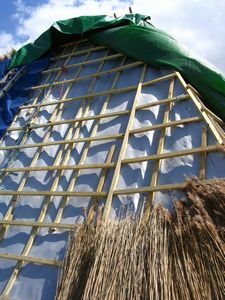 When a roof is stripped down to rafters, or on 'new build', 'Reed & Straw Thatching' recommends the installation of PU28 Thatch Fire Barrier. PU28 is a medium weight fiber glass fabric with a specially formulated aluminum pigmented and fire retardant polymer which provides a heat reflecting surface as well as other properties for the manufacturing of smoke and fire curtains, blinds, cavity wall fire barriers and other types of smoke and fire control systems. As opposed to a rigid fire-board, the material is flexible and will follow the contours of an old roof structure. The material is halogen free, has an improved resistance to hydrolysis (waterproof & breathable) and offers a more rigid handle, it will not rip easily. With a Class 0 fire resistance rating and satisfying BS 476 Part 6: 1989, Part 7 1997, it is acceptable, where required, for Building Regulations. As an incentive to use this product, 'Thatch Fire Barrier' is, for a limited time, offering to supply this to thatchers, builders or individual home-owners, at a very reduced rate. 1.3m x 50m - £450.00 per roll + haulage. There is no VAT to add on to this price, which makes it of great interest to non VAT registered thatchers and home-owners. 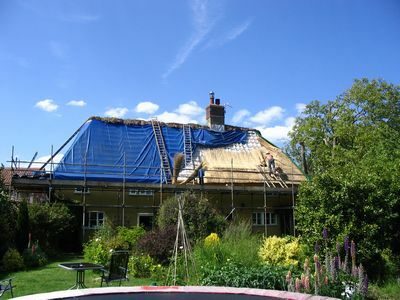 For further information and to order, please contact www.thatch-fire-barrier.co.uk . 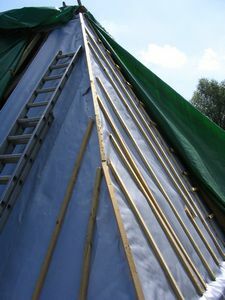 The PU28 thatch fire barrier fabric is fixed on top of the rafters. The recommendation is to lay the strips vertically, to overlap on a rafter, to create a total fire seal. As the thatching requires the ability to fix into the rafters, a counter batten is then fixed to the vertical line of each rafter. 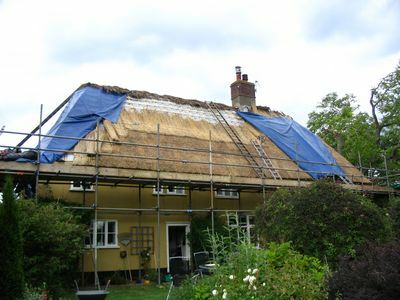 By then fixing horizontal battens, an air gap ,beneath the thatch, of about 50 mm is created.